Non-alcoholic brews soon will replace booze at a Sheridan Boulevard bar. New owners have the keys to the Rock’in R Bar at 2035 S. Sheridan Blvd., and they’re renaming it Mad Hatters Mile High Kava Bar, a 24-hour hangout for customers to drink house-made kava. Kava is a root-based drink that can have sedative and other psychoactive properties. The bar will be the second Mad Hatters location for owners Levi and Judah Love, who started their first kava bar in St. Petersburg, Florida in 2014. The pair purchased the rustic dive bar on Sheridan last week for $715,000, city records show. Levi Love said he and ex-husband Judah started looking at properties in Denver two years ago, wagering that a larger population and fewer nearby kava bars than St. Petersburg would make their psychedelic concept a hit. Plus, he said, Denver has an appetite for unconventional cures. The pair chose the Sheridan Boulevard storefront because they were looking for a freestanding building with lots of parking and a patio, Levi said. They’re financing the new bar out of pocket, and also have secured a SBA loan. Levi said the business is budgeting $40,000 for renovations. So far, general contractor Erin Construction has torn out a stage and started sanding and polishing the concrete floors. The next step is to rebuild the bar. 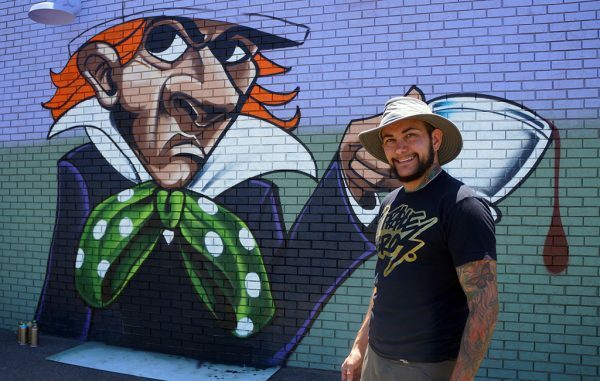 The biggest aesthetic change from Rock’in R will be a series of colorful murals by St. Petersburg-based Vitale Bros. blanketing the inside and outside of the building, including an image of the bar’s namesake Mad Hatter facing the parking lot. “This place will be a spectacle,” Levi said. Levi, 44, and Judah, 34, were career bartenders working in St. Petersburg when they decided to open a bar of their own. But when the pair stopped drinking, they preferred nearby kava bars to their own liquor-serving establishments. In 2014, they sold their liquor license and dubbed their kava-centric venture Mad Hatters Ethnobotanical Tea Bar. Levi said Mad Hatter patrons work and socialize by day, like a coffee shop. And by night, the bar becomes more like a nightclub. 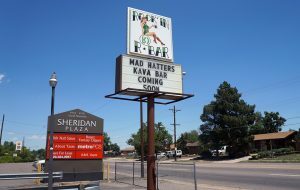 That formula has gone down smooth with customers, Levi said: Last year, the original Mad Hatter had $1.5 million in sales. The pair doesn’t plan to change the recipe for the second location. The Denver bar will follow roughly the same model and menu as Florida, Levi said, serving a variety of kava, kombucha and less-common teas. Like Florida, the bar might expand to have kava smoothies and hookah, too. 3 Comments on "Kava bar to replace Sheridan Boulevard dive"
I am guessing this is not a place for me to go to have High Tea. Is that true?